For the new year, here's an album which is bang up-to-date. 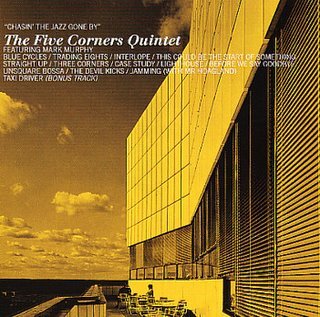 The Five Corners Quintet are a loose collective of (at times more than) 5 players from Helsinki, Finland. They bring a modern production and sensibility to classic 60s straightahead and latin jazz, melding that music with electronics to create something that suggests the past without being a mere pastiche. They've also built up a fearsome live reputation as one of the best straightahead acoustic jazz bands playing at the moment. The vocal tracks are good, with vocalists Okou and Mark Murphy doing a fine job, but the real standout tracks are the instrumental cuts. 'Trading Eights' is a good example of what they're all about. The latin feel of the piece is complemented by the sequenced rhythm section, on top of which the horns exchange thematic lines. The feel is very modern - it could almost have been entirely sequenced - but any impression that this is just studio trickery is lost once the soloists get going around halfway through the track. Most of the other tracks go along in a similar vein, the overall effect being uplifting and enjoyable. Sometimes that's just what you need - and even if this isn't a showcase for the most radical jazz playing around, it still comes highly reccomended. You can read a bit more about the band at their (small) official site.